INDEPENDENT AND PEACEFUL AUSTRALIA NETWORK INC.
MEDIA RELEASE 8 May 2018 IPAN calls for the immediate review of the $3.8 billion arms exports program. The Australian Government has announced a $3.8b program to provide finance to encourage an Australian arms export industry. It has also announced plans to increase Australia’s ‘Defence’ budget to 2% of GDP (in line with US President Trump’s call), regardless of whether this spending is needed or the most effective way of ensuring Australia’s security. “IPAN disagrees with this direction and calls for a review of the arms export program to consider options such as redirecting the funds from arms manufacturing and export to other manufacturing export industries, or scrapping it altogether,” said Ms Kathryn Kelly, spokesperson for the Independent and Peaceful Australia Network. “The Government’s own 2016 Defence White Paper indicated that Australia doesn’t have any real enemies. The only enemies we are likely to have are courtesy of our too-close alliance with the US. Yet the Government’s major ‘defence’ purchases are estimated to total $200b over the next 10 years – this will primarily benefit the multinational military equipment manufacturers, not Australia’s security. An immediate review of the suitability of the arms export program for Australia’s citizens, best interests and security. More aid to our neighbours and areas devastated by conflict – this will do more to build our security than more arms and ‘defence’ spending. Urgent action on climate change and biodiversity. An increase in wages for the lowest paid workers and increase in NewStart allowance. “We need funding for these and other urgent social needs, not an arms export industry and increased ‘defence’ spending,” said Ms Kelly. Dr Nick Abel – former CSIRO climate scientist. This action is part of the Global Campaign on Military Spending. Actions in support of the GCOMS campaign are being held in 20 countries. 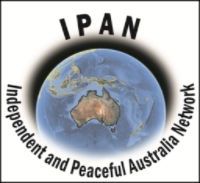 IPAN is a network of over 40 member organisations around Australia – community, faith and peace groups, trade unions as well as concerned individuals – aiming to build public dialogue and pressure for change to a truly independent foreign policy for Australia – one in which our government plays a positive role in solving international conflicts peacefully.